A reflective cinematic soundtrack score by American composer, Terry Lee Nichols, underlining a life's story as ardent, grippng and visceral as any could be. The most vivid and poignant of artistic expression is often drawn from a culmination of the utmost in profound realization, and the absolute of despondence. At Peace Beneath The Shade of My Father's Tree, a cinematic soundtrack score by American composer Terry Lee Nichols, is one such example. Though it isn't a companion peace to a motion picture at all, it still serves to underline a life's story as ardent, gripping and visceral as any could be. “There definitely are cinematic underpinnings to most of my compositions,” Nichols concedes, “I wanted to create a soundscape that reflected specific events throughout my life.” The result: an album of 17 moving and contemplative suites, all designed to tell the artist's story in a non-linear recollection of experiences had, vignettes of moments captured, and a lifetime of challenges bested. Having been cared for by his mother after she and his biological father divorced, Nichols stood as a sort of “pre-existing condition” when she remarried, and grew a larger family with his stepfather. The eldest of four siblings, and the only one fathered by a different man, feelings of disparity and aberration began to creep into Nichols' psyche. This isolation lead him to focus almost obsessively on his interests and studies, the most dominant of which was the world of sound. He didn't just enjoy music, he enjoyed the very blueprint and design of it – and he took to composing and arranging at a very young age. At only four years old, he would entertain his grandmother by playing incarnations of popular songs of the time on her piano. As he grew older, he learned to play the guitar and banjo as well, and by the time Terry Lee Nichols reached high school, he'd taken to composing and arranging music for the school marching band and for drama club stage shows. At Peace Beneath The Shade of My Father's Tree is arguably one artist's very personal set of impressions, but it doesn't fall short of fostering a series of pensive and abstract experiences for its listeners. Where Nichols' solace might be found beneath the cooling shade of a canopy of leaves and branches, with back rested against the steadfast support of that weathered trunk, ours might be found in simply being able to relate, and seeking the clarity to decipher where our own tree might be... or at least discover our inner ability to see the forest through them all. "At Peace Beneath the Shade of My Father’s Tree" is the debut album of pianist/multi-instrumentalist/composer Terry Lee Nichols, and what an amazing first effort it is! The seventeen original tracks are music for piano, keyboards and orchestra plus a few additional musicians. The closing track is an entity unto itself, but I’ll talk more about that later. With a very cinematic feeling to most of the music, the album is designed to tell the artist’s story in a non-linear way. There are very strong classical influences in the music, but it always seems to stay in the present or recent past. The music is melodic, expressive, often uplifting, sometimes very dramatic - much as experiences in life often are. The richness of the music can evoke visual images in a full spectrum of auditory colors, making it an ideal companion for some downtime when you can block everything out but the music. It also works well as background music, but I strongly recommend giving the album at least one play-through without distractions. Just be forewarned that the closing track will jar you right out of your reverie. "At Peace Beneath the Shade of My Father’s Tree" begins with the title track, a blissful daydream of a piece that features piano, acoustic guitar, harp, and orchestra - a wonderful beginning! “Only You” is a romantic slow dance with a graceful sway. Piano and lush strings express sweet emotions and tender moments. “Follow Me” is a favorite. Strings, flutes, piano and bells create a magical atmosphere that is both spritely and a bit mysterious. “Appassionato” is a “big” piece composed for piano and full orchestral - very symphonic. “Timekeeper” picks up the pace considerably, creating a rushed and pressured feeling - “I’m late!” - that runs through most of the piece, slowing down near the end. “Train to Dachau” begins with the sound of a train traveling down the tracks and then stopping. The music that follows is dark and mournful, as a visit to such a place would be. The piano is especially poignant on this track. “On My Way to See the Dancing Sisters Figg” turns joyful and exuberant with the combination of piano, strings and pennywhistle. “A Curious Life” is another favorite. It starts with pizzicato strings that set a tone of mystery. It evolves into a touching duet for piano and cello, with more strings added as the piece develops. The solo piano passages are (to me) the most effective as they seem to come directly from the heart. I also really like “Last Train Home” and its sense of movement and feeling of anticipation. This one hints at Yanni’s influence. The soothing and comforting “Lullaby” should take you off to Dreamland just before the nightmare of “Requiescat,” the closing track. This piece is a montage of speeches, new clips, and sound bites that deal with the epidemic of gun violence. It focuses especially on the incident in Idaho where a two-year-old shot and killed his mother in supermarket with her own gun. Some of the clips are voices of desperation, and they are very painful and unsettling to hear, as are the sounds of gunshots. While I applaud Terry Lee Nichols’ taking a stand and assembling such a powerful piece, it’s a shocker after his beautiful music. "At Peace Beneath the Shade of My Father’s Tree" is an impressive debut! I have found personal solace within this release, having lost my father a few short years ago in 2012, Nichols has really hit home with this powerful emotional album, it’s a healing work of art to enjoy and remember, as it touches on life and all its little nuances. The title track is the first offering and of course called At Peace Beneath the Shade of My Fathers Tree, there is such a symphonic mastery involved here with the added instrumentation, yet the piano is our narrator on this journey and weaves the tale of this story so well. The tides of time, tears and happiness flow majestically on this release and on Only You, we have a happy motif that has a powerful melody, but one that touches the heart with glee. While on Follow Me, we have a more delicate narration in the beginning, that breaks into a superbly symphonic moment of magic and confidence, in an almost film score style. Terry Lee Nichols performs a delightful short form piece of just over a minute on the composition called Reflections, then within the piece Appassionato we hear something classically brilliant and deeply stirring, as of course you would expect from a track of pure passion and enthusiasm. The change of tempo really gives us a sense of time moving relentlessly onward on the piece Timekeeper. The one thing we can do nothing about, the onward march of times cruel fate and this one has a real sense of persistence and an unyielding inevitability about it. On Train to Dachau we have that sense of movement in music, highlighted by the steam train, but this would be a journey that no one would ever want to take. This brings back memories of my trip to Munich, a trip I took in peace, many had to take in fear and this opus of remembrance is a remarkable and very poignant reminder that nothing like this should ever happen again, beautifully and respectfully composed by Terry Lee Nichols. I had to take a break of an hour, as the last track moved me so deeply, I had to take some time and compose myself; perhaps it was out of gratitude that my father escaped the Japanese camps in World War 2, such memories, such gratitude, total respect. Once back, I placed my head phones back on and instant healing occurred in the guise of the track Pamela’s Time, a song of dedication, which had such a beautiful light angelic presence about it. The smiles can be found in the next piece, just hiding over the hills, as we go in search of the Sisters Figg on the lively Celtic themed track, On My Way to See the Dancing Sisters Figg. How perfect was this, light, happy a real cheer filled jig of a tune to lighten the mood as we cross into the second half of the release. I always found winter to be an emotional time; the darkness spreads from all corners, from each direction the cloak of stillness and coldness touches us all. Here on A Winter’s Tale, memories of long January and February days are explored in an opus of musical majesty that raises the spirits and leaves us with a little piano snowfall perhaps? Sailing is up next, Terry Lee Nichols is another one of those musicians who seems to have the ability to paint with music, here one can imagine sailing boats changing course in a summer wind, this is a stunning composition filled with sea air and long days of endless sunshine smiles. From time to time, I guess we may have all been at the Crossroads. Which way do you go? From this composition I would suggest that Nichols, whose arrangement here is so powerful, may say, go with the heart and never look back, this is one piece that really builds and explodes with a heartfelt passion. A Curious Life is our next piece, I wrote a poem the other day on almost the same subject, we do seem to lead lives that are baked with a fine helping of drama, and on this track the artist seems to ponder a while on this thought. Once more the strength in music is found to be the healer, but the melody and musical ethic here is so very cleverly composed and brilliantly arranged, to give us a feeling of looking back and thinking, life? What was that all about? As we head towards the end of the album, we come across a track that has a really thoughtful motif; there is a luscious sense of movement thanks to some wonderful percussion and guitar here, one can truly feel like they have taken their seat on the Last Train Home. Now I have read and written much on the subject of the most emotional season in the world Autumn. The season of mists, falling leaves and crows making their way home in the fading light, all of that and more can be pictured here in this redolent moment of seasonal musical memory. It’s time for bed kids, I can still remember saying those words, and here Terry Lee Nichols brings those musings of childhood back in a sparkling symphonic production now known to us as Lullaby, music that is the path way to a multi coloured wonderland. The last piece off the album could be controversial, Requiescat, a prayer, a wish, or a repose, for those who are dead. Gun control, Charlton Heston and other audio clips and themes are used in this deeply emotive song about the tragic pointless loss of life, life, something so deeply precious, but sometimes so easily abused. Terry Lee Nichols, dear reader and listener will leave you with much to ponder, at the end of this track. The multi instrumentation used on this album and the skills of those musicians performing is simply sublime; Terry Lee Nichols must be applauded for bringing to us a producer and saxophonist as talented and thoughtful as Farzin Farhadi, percussion and drums, the engine room and usually overlooked, but combine it with the drums of Joel Taylor and the work of Luis Conte, it was simply beyond beautiful. Let us not forget the supreme expertise of both guitarists, bass and lead, featuring Craig Sharmat and Hussein Jiffry, a combination of sensitive performing on an album created and manifested into this world by Pianist Terry Lee Nichols. This is a cinematic, this is musical emotion, there is simply something here for every true music lover, prepare your heart for a journey deep within the weave of life’s very rich pattern. You will find this album a total must for your collection, At Peace Beneath the Shade of My Fathers Tree, is breath-taking and a veritable musical rollercoaster of genius. For some recording artists, their songs or the theme of their album can be abstract conceptually, while for others like Florida-based composer, pianist, and multi-instrumentalist Terry Lee Nichols, it can be extremely personal. The album features 17 songs that paint portraits of experiences had and vignettes of life moments captured. Terry’s love of music for film adds a cinematic dimension to his sound. As can be expected from the title track which opens the album, the song has a serene and nostalgic ambiance that invites the listener into Terry’s musical and personal world. The graceful piano melody is augmented by rich strings and orchestration that Terry played on the keyboard with virtual instruments, making for a wonderful beginning to the album. On most of the songs, Terry is creating all the sounds. However track 2, “Only You,” as well as two other songs were recorded live in LA with a number of A-list musicians whose credits collectively include Yanni, Phil Collins, Celine Dion, James Taylor, Madonna, Dionne Warwick, Whitney Houston, and a long list of major artists. There’s an easy rolling feel to the song with hints of pop and smooth jazz influences. One of my favorite tracks on the album, “Timekeeper,” has a more cosmic perspective. The song has a dynamic repeating arpeggio that provides a sense of forward movement with lush layers of strings providing an expansive ambiance. The interestingly titled,” On My Way To See The Dancing Sisters Figg,” taps into a different side of Terry’s musical spectrum with a wee bit of a Celtic flair. It’s a lively upbeat tune complete with pennywhistle sound that may inspire you to dance a little jig, if only in your mind. “Sailing” was one of the three tunes that was recorded with the studio musicians in LA, as mentioned above, and was also one of my favorites on the album. It has a breezy, wind in the face feel that carries you along on its jazzy positive energy. Undoubtedly, Terry has saved the most powerful, dramatic, and moving piece for last, which goes beyond being a song to being more of a musical documentary dealing with the issue of gun violence. Along with the music, the track features a number of newscast clips and sound bites that make for an intensely compelling listening experience. I am greatly impressed by Terry’s skill, not only as a superb pianist, but also as a talented composer and arranger. Terry’s love of film soundtracks is very much in evidence here, and many of his compositions would make outstanding movie scores. Although this is his debut album, it definitely feels like the work of a mature and seasoned recording artist. With an auspicious start like this, I’ll be looking forward to many more cinematic soundscapes from Terry Lee Nichols. 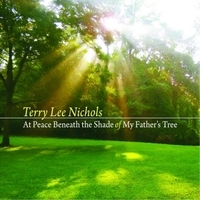 “At Peace Beneath the Shade of My Father’s Tree” is the debut album from pianist and composer Terry Lee Nichols. Comprised of seventeen tracks spanning just over an hour, Nichols has drawn much inspiration for this album from deeply personal experiences and events occurring throughout his lifetime. He is joined by other musicians on varying compositions, including Luis Conte on percussion, Joel Taylor on drums, Craig Sharmat on guitar and Hussein Jiffry on bass. Farzin Farhadi is the album’s producer and also lends soprano sax, while Franz Pusch is the recording’s engineer. A live string orchestra is prominently featured throughout, infusing much of the music with a sweeping and cinematic feel. The title track sets the mood for the rest of the album with its melodic ensemble of piano, guitar and string instruments. Nichols often lends a delicate touch to his playing that is accompanied by sweeping stanzas with a sentimental flair. Several of the compositions feel distinctly seasonal in nature and I particularly enjoyed the ones that reminded me of autumn and winter. The beautiful “Timekeeper” is one such example which bears a cinematic quality that would deem it perfectly fitting in a Christmas themed fantasy movie. Its glistening textures and light bell-tones mimic that of falling snowflakes, as the hurried pace of the piano and accompanying strings feels like rushing to reach a destination. A particularly intriguing moment on the album includes the highly realistic sound of a passing train on “Train to Dachau”, which eventually comes to a stop before leading into a tender arrangement of piano and strings. The magical “A Winter’s Tale” is another favorite of mine in which a haunting piano melody moves through minor keys amidst gossamer strings and streams of light. “Last Train Home” is another traveling piece that features piano, bass, guitar and percussion. Its steady rhythm mimics that of a moving train while the overall composition bears subtle elements of smooth jazz. I’m also particularly fond of “Autumn”, which is characterized by gentle strings and a peaceful piano melody. Its added chimes sprinkled over a symphonic and tender arrangement of instruments perfectly capture the sun’s golden rays peering through a tree’s turning leaves. Overall, I found this album to be positive and uplifting with much of its content seemingly fitting for a Hallmark Channel movie. Most of the compositions exude an emotionally tender and sentimental quality, while incorporating an overarching theme of travel, time and changing seasons. Those who are especially fond of neoclassical, contemporary instrumental and cinematic piano-ensemble music will likely find much here to appreciate.